The first edition, last school year in May, was a big success! 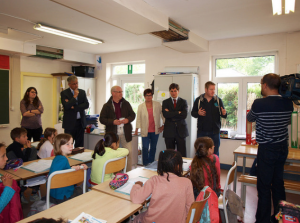 With thirty participating schools, a lot of very enthusiastic pupils, teachers and parents, and coverage from the local press, the message was heard loud and clear throughout Wallonia. For more photos of the campaign, check out this link. Just like last year, it looks like the current campaign, which is taking place during and after the European Mobility week from 16 to 22 September, is going to be an enormous hit! As many as twenty-six new schools signed up. 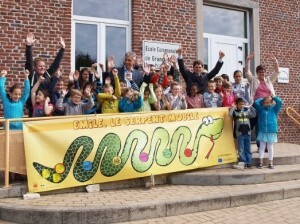 In addition, thirty schools located in the German-speaking Community of Belgium have decided to join us with ‘Zora Zisch, die Verkehrsschlange’. Welcome East Cantons! Good luck to you and to Wallonia!